A great travel hair dryer should be chosen as carefully as your main dryer – who wants a substandard hair do while they’re holidaying! We’ve tested driers at all price points and our six best are all compact, all have foldable handles, nice to handle and give a good blow dry experience. But which dryer is THE BEST? We’ve crowned the GHD flight king of the travel dryers. Our group test is made up of six travel hair dryers, each from a different brand, ranging from luxury models through to budget buys. How much you’ll want to spend on a travel dryer will depend not only your personal budget but also how much you travel and of course how important that perfect blowdry is to you. We carried out our testing was over a period of weeks, using each of the hair dyers over a set period of time every morning, after washing, using the same shampoo and conditioner. Our tester has thick hair, styled in a straight chin length bob, which is always dried straight and sleek. As everyone’s hair is weaker and damaged more easily damaged when it’s wet, to protect your hair it’s recommended that when you blow dry you start on a low heat setting and stop when you feel your hair change temperature – that’s the signal for it being dry. Dryer price, looks, handling and performance varied largely between models but each in our top six is a worthy piece of travel tech. 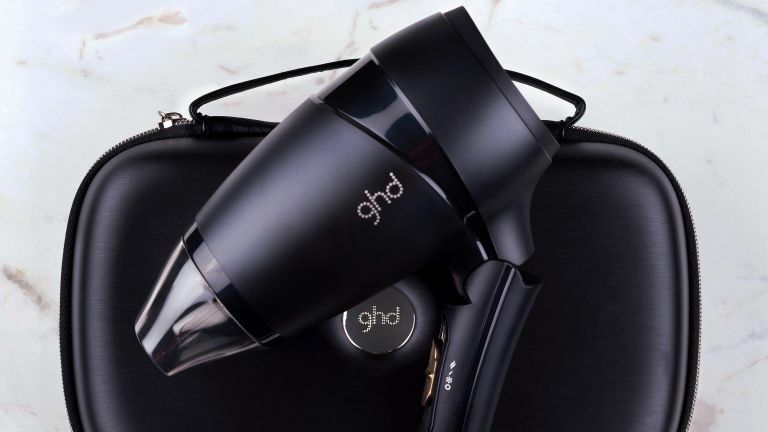 Of course only one travel hair dryer can take the crown of THE BEST on the market and that accolade goes to the outstanding GHD flight – small, lightweight, powerful and capable of producing a blow dry as good as a full size dryer. There’s a lot to love about the GHD flight – starting with it’s good looks and ergonomic design – despite being small and light (it weighs a light 423g) it’s a joy to use and easy to grip. It features two speed/heat settings, a cool shoot feature and GHD hair safeguard technology - it automatically switches off when held too close to hair to prevent over heating. Build quality felt equivalent to its full size counterpart – the brilliant GHD Aura, although it is in fact 60% lighter. Impressively, the GHD flight has 85% of the power of its full size counterpart and it certainly feels like it – we achieved a fast blow dry and looked healthy and shiny without frizz. The dryer comes with it’s own GHD branded protective travel bag and has universal voltage so you can use it anywhere. There's no disputing that the T3 Featherweight Compact is one of the most compact on test – it’s sleek appealing looks in white with rose gold accents mean you’ll want it on display rather than in a drawer (or, maybe not). Build quality is high as is the user experience is high too – as well as being small, it’s lightweight and quiet. It comes with a concentrator nozzle and 2 speed/heat settings and lock in cool shot. It gives a lovely blow dry experience with a shiny sleek finish and not a hint of frizz. It has dual voltage so perfect for travelling. Performance was on par with the GHD flight but the price tag is double, hence it not winning our top spot. The BaByliss Nano Travel Dryer is one of the lightest on test, making it ideal for a travel dryer. Unfortunately it doesn't fold however, so could take up more space in a suitcase. That said, we were very impressed with its performance. It’s easy to grip and feels well built in the hand and has the look of a conventional dryer. The 1200W dryer features two-speed and two heat settings and it includes a precision styling nozzle. It gave a sleek, frizz-free blow dry in a time comparable to a standard dryer – an excellent performance. It comes with an excellent multi-voltage feature, which allows you to adjust the voltage screw to correspond with the voltage required (125 V or 240 V) when travelling abroad. If you've got longer hair, then you may want to opt for a more power travel hairdryer, or, more specifically, this Remington. With two heat and speed settings delivering a powerful 2000W, you can count on it to quickly dry hair whenever you need it. It's designed with mobility in mind, with a foldable handle making it ideal for slipping into any bag, whether it’s for the gym or a hotel. The Remington is also the only dryer on this list to come with two accessories, a concentrator and compact diffuser. The foldable Braun Satin Hair 1 Style&Go dryer is the smallest on test – you’ll hardly notice the tiny, light dryer it in your case. Despite its small proportions, the Satin Hair 1 was still comfortable to hold, although the plastic body can cause your hand to get clammy while drying and it can slip – but we can forgive this at the price. The dryer has two heat settings and it features an infrared heat source that prevents hot spots and dry-out. We found the drying experience to be pleasant and hair was left feeling healthy, full of body and with a little frizz but nothing to get upset about. The Braun Satin Hair 1 has universal voltage so you can use it wherever you are. The Boots travel dryer has a basic design, but is small and light and inoffensive looking – we think it resembles microphone… Like the other models on test with smooth plastic bodies, your hand can get a little sweaty with the heat and slip slightly. The dryer features two heat/speed settings but unfortunately the switch is very stiff and requires a fair bit of pressure to move between them. Other than this the dryer, which comes with a concentrator nozzle, worked well with a good amount of power and left hair with a healthy bounce and a little frizz but nothing major. Happily, the Boots travel dryer has dual voltage so you can use it anywhere with adaptors. We’re impressed with the 4-year guarantee at the tiny price point.